The UNGP Reporting Database is staffed by our small team of specially trained analysts who manually read companies’ entire body of disclosure, looking for relevant information about human rights. With over 90 companies in the Reporting Database, our analysts are in a prime position to share insights about trends they’re seeing in company disclosure on human rights, and whether or not that disclosure is meeting the expectations of the UN Guiding Principles on Business and Human Rights. On this page we provide links to a running series of articles and commentaries, as well as major research reports, that address trends, gaps and progress in company reporting on human rights. If you’re interested in learning more about our insights, or republishing these articles elsewhere, please write to us at info[at]ungpreporting.org. Over the past few months, Shift has analyzed the human rights disclosure of 18 Canadian mining companies (traditional mining companies, along with a number of streaming and royalty companies). Our research revealed strengths and weaknesses of the sector’s reporting trends, which informed our key recommendations. In the context of the new Duty of Vigilance Law, Shift’s “Human Rights Reporting in France” aims to evaluate the extent to which the new French legislation brings companies closer to the reporting expectations that were set by the UN Guiding Principles on Business and Human Rights. In Part I, Shift analyzes the maturity of human rights reporting pre plan de vigilance, by examining information from 2017 and early 2018. This report establishes a baseline against which we will evaluate improvement. Shift will release a report later this summer that examines the extent to which the human rights disclosure of the Top 20 listed companies in France (CAC 40 Index) meets the expectations of the UN Guiding Principles. This research report, authored by Shift’s reporting team, examines the maturity of human rights reporting of 74 global companies from seven sectors. The report unveils a new methodology for assessing leaders from laggards, and provides recommendations to investors and others about hallmarks of good reporting and how to engage with companies to support improvements. The report was supported by the UK Department for International Development, EY and Hermes Investment Management. Are palm oil companies leaders or laggards in reporting on human rights? Whether or not we know it, average consumers come into contact with palm oil every single day. This cheaply and efficiently produced agricultural commodity is the most widely consumed vegetable oil on the planet. 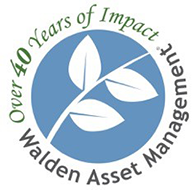 It is currently used in 50 percent of all consumer goods and is found in everything from margarine and chocolate to soaps and fuel for cars. Yet this booming industry’s growth has come with some significant costs. It has long faced criticism for its deforestation of tropical rainforests, which in turn destroys critical habitats for endangered animals and contributes to climate change. More recently, its human rights impacts have come into equally sharp focus as the sector has been linked to forced and child labor, as well as the displacement of indigenous peoples. Given the serious human rights impacts associated with this industry, and based on increasing interest from investors, stock exchanges, and companies themselves, we have begun to analyze what palm oil companies say they are doing on human rights in order to cast light on where improvements need to be made. To do this, we have mapped top palm oil companies against the expectation that companies know and show how they are demonstrating respect for human rights, in line with the UN Guiding Principles. To date, we have mapped the top five palm oil companies, by market capitalization, from the FTSE Bursa Malaysia Asian Palm Oil Index: Sime Darby Bhd, Wilmar International Limited, IOI Group, Kuala Lumpur Kepong (KLK), and Golden Agri-Resources (GAR). We will be analyzing more palm oil companies’ disclosures in the future. Overall, we find that these palm oil companies are demonstrating relatively strong policy commitments to respect human rights. However, according to these companies’ own disclosure, they have much work to do with regard to focusing their efforts on salient human rights issues, explaining how they are preventing and addressing them, and providing information about the extent to which those measures are working. Are companies taking a principled approach, or are they cherry picking which issues to report on? 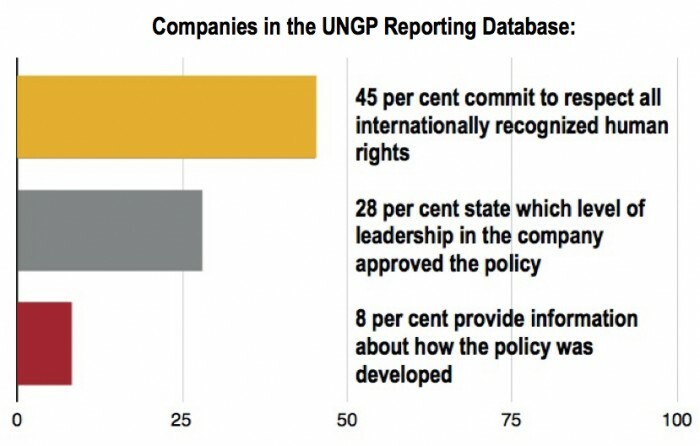 After a year of mapping companies’ human rights reporting against the expectations of the UNGP Reporting Framework, Shift’s research and analysis reveals that over half of companies provide no clarification about which human rights are most relevant to their operations and value chains, simply listing certain rights without any apparent rationale. This should leave any reader concerned that the company has no clear idea where its greatest potential impacts on people lie — its salient human rights issues — and therefore may well not be managing those risks. Many companies have a commitment on human rights — but where is the explanation of accountability for its implementation? In the previous article in this series, we noted that 75 per cent of companies in the Reporting Database have a policy commitment to respect human rights. Far fewer companies, however, are clear about the governance and accountability structures they have in place to ensure the policy is implemented. Indeed, while 80 per cent of companies in the Reporting Database mention having a committee responsible for sustainability, CSR or ethics and compliance, 62 per cent fail to tell us if that committee is actually accountable for their human rights commitment. Without this governance information – the explanation of oversight structures that are critical to embed the policy commitment into practice – stakeholders can have little confidence that the company can effectively manage its human rights risks. Making the commitment — but is it a strong one? While 75 per cent of companies in the Reporting Database have some kind of high level policy commitment to respect human rights, the quality of those policies varies significantly. The graphic below shows key gaps in what companies tell us about their policies on human rights — which should flag some real question marks for readers concerned about governance and ultimately how these companies manage their human rights risks. Read more about what’s expected on companies on their human rights policy commitment in the complete article.